For this mouthwash, use a tablespoon full of ripened sesame oil (ripen by heating briefly up to 100°C), rinse your mouth for a short while and then „swish“ the oil vigorously between the teeth for 2-3 minutes. Do not swallow the oil, but spit it out, because now it contains debris and harmful bacteria dislodged from the mouth. Avoid spitting it out into the sink, because the oil can clog the drain. This mouthwash, done regularly, nurtures the mouth and throat and is said to prevent caries and periodontal disease. A natural way to keep your breath fresh, say the Ayurvedic texts, is by chewing certain spices after eating, for example, anise and fennel seeds, cardamom and cloves. These spices not only have a cleansing and disinfecting effect, but also taste good and stimulate digestion. A good, practical alternative to the above is the Ayurdent mouthwash. This pleasant tasting mouthwash is based on a traditional Ayurvedic formula, and is BDIH certified: „certified natural cosmetics“. 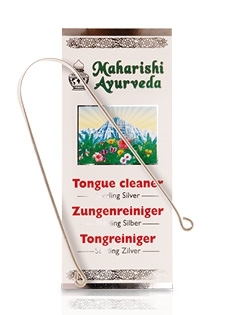 Ayurveda places great importance scraping the tongue every morning. It is best to use a metal tongue scraper. This takes only a few seconds, but has a good effect on your overall well-being. On this subject, the German Dental Association says that bacterial plaque and bits of food settle on the tongue, which not only affect the delicate taste buds on the tongue, but can also be the cause of bad breath. A Toronto study found that cleaning the tongue reduces putrid gases and bad breath by about 75%, whereas usual teeth cleaning only produces a reduction of about 25%. The mechanical removal of microorganisms thus plays a key role in combating bad breath. In addition, the physicians' association of North Rhine says that tongue cleaning could, like brushing your teeth, help to reduce the risk of caries and to support dental health. Scrape away the covering on your tongue with a special tongue cleaner made of metal. 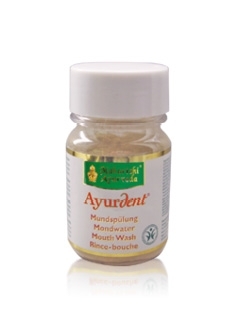 Clean your teeth with Ayurdent toothpaste or Ayurdent tooth powder. Rinse your mouth with 1 tablespoon of "ripened" sesame oil for a few minutes. Finally, refresh your breath with Ayurdent mouthwash, which can also be used during the day.